For better or worse, there will come a time when you need to print a small image. Whether you snatched it from the Web—say, a book or DVD cover from Amazon or a head shot of your organization’s next speaker—or you received it from someone who no longer has the original, the problem is the same: small images contain precious few pixels for you to work with. If they came from the Web, they’ll have 72 pixels per inch (ppi)—a resolution so low that the pixels will be visible when printed. Unless you like that blocky look, you have to increase resolution before you print it. And, as you learned in our previous article about how to resize digital images for printing, increasing image resolution results in a smaller print size. In this article, I’ll show you how to increase resolution and if you must, the pixel dimensions, of small images so they print well at the sizes you need. How big can you print it? Chances are good that the small image you want to print came to you via the Web or email, so you’re viewing it onscreen at its full size. A good rule of thumb is that the image can be printed well at half the size it looks. For example, if you start with an image that’s about two-by-two inches onscreen, it can print decently at one-by-one inch. Unless you’re printing from a program that automatically alters resolution when you enter a desired print size (iPhoto) or you trust the print dialog box’s Scale to Fit option (Preview), you’ll need to tweak its settings. Open the Image Size dialog box in Photoshop (choose Image -> Image Size) or Photoshop Elements (Image -> Resize -> Image Size), or the Scale dialog box in GraphicConverter (Picture -> Size -> Scale). Turn off the Resample Image checkbox (or the Scale Picture checkbox in GraphicConverter) to lock pixel dimensions and protect image quality. Enter a number in the resolution field and each program shows you what the resulting print size will be in the width and height fields. If you need a bigger print, decrease the resolution incrementally until you reach 140 ppi or so (see our article on image resolution for more). Method 1 Adding pixels 5 to 10 percent at a time won’t completely destroy your image (it causes some quality loss, but not as much as increasing the size by 900 percent all at once, though that ability got a lot better Photoshop CS5). Open the Image Size dialog box and make sure both the Resample Image and Constrain Proportions checkboxes are turned on (in GraphicConverter, turn on Scale Picture and Proportional). In Photoshop or Elements, choose Bicubic Smoother from the method pop-up menu (choose Smooth from GraphicConverter’s Algorithm pop-up menu). Then, in the dialog box’s Document Size section, change either the Width or Height pop-up menu to Percent (the other field changes automatically). Enter a number between 105 and 110 into the Width field and then click OK (the Height field changes to the same number automatically). Repeat the process until the image has enough pixels to get the resolution you need. Method 2 Some Photoshop pros swear by this method for large-format printing: In Photoshop or Elements, open the Image Size dialog box and make sure the Resample Image and Constrain Proportions checkboxes are turned on. In the Document Size section, enter either the width or the height of the desired print. Enter your desired resolution, choose Bicubic Sharper from the pop-up menu at the bottom of the dialog box and then click OK. The pros swear this method gives them terrific results (as mentioned earlier, the pixel-adding prowess of Photoshop CS5 is much better than in previous versions). 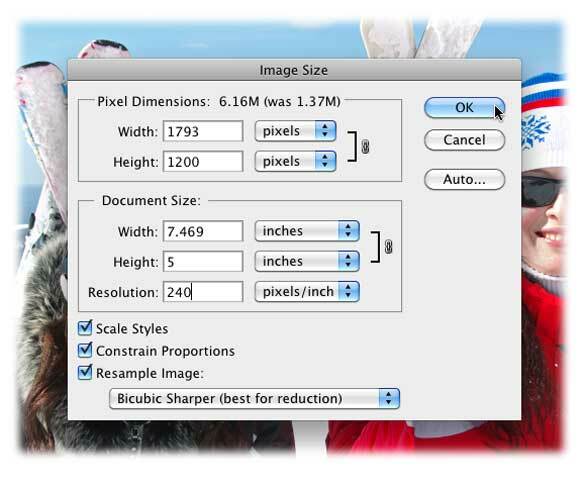 In Photoshop CS5's Image Size dialog box, turn all three checkboxes on at the bottom and then enter the size and resolution you need. Here, we've increased the image size to 5 by 7 inches at 240 ppi. Method 3 Buy a third-party plug-in for Photoshop or Photoshop Elements specifically designed to fabricate pixels, such as onOne Software's Perfect Resize (formerly Genuine Fractals), BenVista's PhotoZoom Pro, or Alien Skin Software's Blow Up 2. The plug-ins manage to pull off some serious pixel-adding voodoo with truly amazing results. Instead of adding pixels throughout the image, you can add pixels to unimportant backgrounds—say, a big sky or swath of grass—by using the Content-Aware Scale option (Photoshop CS4 or later) or the Recompose Tool (Photoshop Elements 8 or later). Both options examine what’s in your image and then intelligently add pixels to unimportant areas as you change the size using a bounding box that looks just like a Crop box. Once you’ve opened the image, double-click the Background layer to make it editable and then add extra canvas space by using the Crop tool (draw a crop box around your image and then Option-drag one of the corner handles outward; press Return to accept). Next, choose Image -> Content-Aware Scale in Photoshop, or activate the Recompose Tool in Elements (it lives inside the Crop toolset in Full Edit mode). Draw a box around the whole image and then drag any handle outward to make the image bigger. Once you press Return to accept the change, pixels are added and your image size changes. Return to the Image Size dialog box to see if you’ve got enough pixels to enter the resolution you need. By using Photoshop Element 9's Recompose tool (circled), you can enlarge unimportant areas such as the sky and snowy background. Here the image is being enlarged by dragging the left center handle (also circled). As you can see, making small images print well takes some effort, but it can be done.